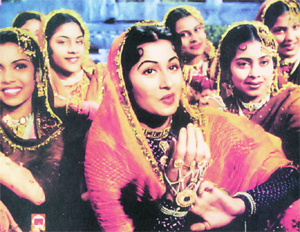 The dance sequences featuring Madhubala and hundreds of junior artistes in K. Asif’s magnum opus Mughal-e-Azam took the audience’s breath away. Forty-eight years after its release, the magic of the Salim-Anarkali legend in K. Asif’s magnum opus Mughal-e-Azam lives on. Released on August 5, 1960, it was the first movie ever to be produced in Mumbai at a cost of Rs 10.5 million. When K. Asif spent Rs one million on the Sheesh Mahal to picturise the classic song Jab pyar kiya to darna kya, many thought his financier Shapoorji Pallonji would go bankrupt. According to Dilip Kumar, who played Salim, it took seven years to complete the film that was premiered at Mumbai’s Maratha Mandir theatre. Released in 150 theatres all over the country simultaneously, which itself was a record in those days, it became an instant hit and collected a record revenue which remained unsurpassed till G.P. Sippy’s Sholay broke it 15 years later. Asif had planned to make the movie way back in 1944 after he read a play on the 16th century affair between the prince and a commoner during the reign of Emperor Akbar. He went ahead with it, casting Chandramohan, Nargis and Sapru for the roles of Akbar, Anarkali and Salim, respectively. But the perfectionist that he was, he suspended the movie and restarted it in 1953 with Prithviraj Kapoor, Madhubala, Dilip Kumar, Durga Khote and Ajit in the cast. Initially, Dilip Kumar was reluctant to do a historical movie, but he gave in when Shapoorji Pallonji insisted that he play Salim. Asif sent Dilip Kumar to London to try out the wig he wore in the movie. Mughal-e-Azam was seven years in the making all right, but when it was released, its awesome battle scenes, splendour of the Mughal court, ensemble dances picturised on Madhubala and hundreds of junior artistes took the audience’s breath away, for the like of this had never been portrayed on the Indian screen before with such finesse, dazzle and perfection before. It was a signature movie of K. Asif and the only magnum opus he could complete. After the success of Mughal-e-Azam, he had started Love and God with Guru Dutt and Nimmi in the leads. But it had to be shelved due to Guru Dutt’s death. Later, Asif revived it with Sanjeev Kumar as the male lead. But it was not to be as he died during its making. Later, in 1986, producer-director K.C. Bokadia released the incomplete movie as a tribute to the late filmmaker. Asif had planned to make Mughal-e-Azam in three languages — Hindi, Tamil and English. While the Hindi version became a super hit, the Tamil-dubbed version came a cropper at the box-office and he subsequently dropped the idea of dubbing it in English in the voices of British actors. The making of Mughal-e-Azam was a gigantic affair, but Asif carried it out patiently and painstakingly. Tailors were brought from Delhi to stitch the costumes, specialists from Surat were hired to do the embroidery, goldsmiths from Hyderabad designed jewellery, craftsmen from Kolhapur worked on the crowns, ironsmiths from Rajasthan made the weaponry and shoemakers from Agra produced the royal footwear. For the battle scenes, 2,000 cameras, 4,000 horses and 8,000 soldiers were used. Most of the soldiers were taken on loan from the Jaipur Regiment of the Indian Army. Although the movie was made partly in colour, the full colour version was released in 2004. It was the first Indian movie to be released in Pakistan after Indian movies were banned there following the 1965 war.